"...I went up yesterday to the city of Taipei in accordance with an arrangement made with the Imperial Commissioner to see the heads of some of the Frenchmen that were killed during the fight of the 8th of October last, so as, if possible, to pick out Lieutenant Fontaine's one. Dr Johansen, the medical attendant on this consulate who consented to accompany me, was of the greatest assistance as a scientific man; and I am glad to say that we succeeded in identifying the head, even though it was almost a bare skull. I brought it down to Tamsuy with me, and buried it in the consulate grounds till the views of deceased's family can be ascertained. I shall send a separate report about the recovery of the head to Earl Granville [Note: probably the Foreign Secretary who instructed Frater to recover Lt Fontaine's head] direct..."
Two points: (1) Clearly Liu Ming-chu'an's claim that the heads of the Frenchmen were already buried in Oct, 1884, was not true; and (2) Burial of Fontaine's head in the "consulate grounds" was apparently a temporary measure; although we still do not known what Fontaine's family views were. *Notes on Alexander Frater: Age on first appointment of China consular service: 22. Father's occupation and place of residence: Assistant city chamberlain, Aberdeen. He retired as consul at age of 52 due to ill health. Age of death: 53. Remarks: nominated by Aberdeen University. Previously was War Office clerk. My last report on the state of affairs in North Formosa was dated the 20th ultimo; and I now proceed to relate the occurrences since then. I have already acquainted you with some of them in private letters. The British subject, Purse, that served as a gunner in the Chinese Army was sent away on the 26th of June to the mainland. His behaviour had not been good, and Liu Ming-chu'an was glad to get rid of him. He went, I believe, from Amoy to Shanghai. The British pilot, Bentley, who took service with the French left with them when they quitted Kelung, and has gone on to England. After the French left Kelung, Liu Ming-ch'uan, knowing that many of the inhabitants had had their houses destroyed by the French appointed a Compassionate Committee to distribute funds among such, and also among persons whose relatives had been killed by the enemy. A proclamation of the 24th of June calls for applications within 20 days. A public notice, of the same date, by the two Imperial Commissioners Liu Ming-ch'uan and Yang Yo-jun invites Chinese to return to Kelung, grants an amnesty to persons who had worked or acted as linguists for the French, provided they had not helped to injure the natives or looted or killed, and gives liberty for the arrest forthwith of anyone found seizing the land or goods of another. Shortly after the evacuation of Kelung by the French, their cemetery was attacked during the night, and the monuments and wooden crosses were thrown down. Happening to see Liu Ming-ch'uan on the 14th instant, I spoke to him about the outrage and said the French would be sure to be very angry if they heard of it. I advised that he should cause repairs to be made. He replied that he had been told of the occurrence, and had given orders for the cutting in stone of a protective proclamation, a copy of which he showed to me. He added that he had already ordered the tombstones to be put up again, and asked whether I had not heard that his orders had been carried out, to which I could only reply that I had not. The repairs were begun only on the 18th, soldiers being employed for the purpose; but the tombstones were thrown down again during the night. I was in Kelung on the 26th and 27th and visited the Cemetery. The proclamation cut in stone was not there, nor was it on the spot on paper. Two or three of the monuments had been fairly handsome ones and it was sad to see the top portions of them lying broken off. Many of the wooden crosses had been removed, and thin bamboo ones put in their place. On the 2nd of July the S.S. "Foochow" took a portion of the garrison away from Tamsuy to Taiwanfoo. Some of the hillmen have been disbanded. To prevent disturbances they were marched into the hills and embodied till their monthly pay was due. General Sun changed his residence to Bangka on the 25th instant; and a portion of the Tamsuy force has been sent to Kantow. The torpedoes that were sunk in the entrance to the harbour have been raised, but three or four cannot apparently be found. The land torpedoes have also been dug up. The wires of the submarine ones show much damage. The sunken junks have not been removed but they do not seem to be much in the way of vessels. Liu Ming-ch'uan wondering at the delay of the French in evacuating the Pescardores, sent General Wu in the Chinese ship of war "Wan Nin Ching" off on the 14th instant to learn the reason. She returned on the 26th. According to her Captain, Admiral Lespes was waiting for a letter from the French Minister. While the "Wan Nin Ching" was at Port Makung the letter arrived, and the evacuation shortly afterwards commenced. One French vessel was left behind to pick up a missing torpedo. The "Wan Nin Ching" on her return to Tamsuy brought the Acting Taotai of Taiwanfoo to conduct the annual literary examinations of this district. The matter of compensation for the destruction of the mission chapels is being gone into. Dr. Mackay has been away for severl days visiting the chapel sites in company with deputies of the officials. The payment of a portion of the claim of Douglas Laprail Co. for the destruction of their steam launch near Paksa Point has been offered by the leading men of the neighbourhood. Separate reports about these compensation cases will be duly made by me to you. 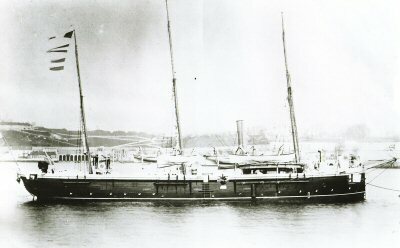 Admiral Sir William Dowell visited Tamsuy in H.M's. S'Andrews on the 18th instant. Alexander Frater was based in 紅毛城the Red Fort [Fort San Domingo] in Danshui. The above was just one of his numerous reports. All the major end-games are described in detail in this dispatch: Danshui Harbor pilot Bentley (aka Carozzi) finally went back home to England; all the mines were cleared from Danshui; Dr Mackay was seeking, and eventually received, compensation for his losses; the French departed from Peng-hu; and the warship Wan Nin Ching was in service again. The vandalized French Cemetery in Keelung (image at top) was not kept up until after the Japanese colonized Taiwan in 1895. [Source of Frater's reports kindly provided by Patrick Cowsill]. "Mr Ji Rong-Da [of Tamkang University] states that even though these artifacts may not look appealing, each one actually represents a part of the history. 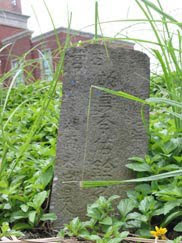 An example is a tombstone erected in Tong-zi era (1856-75) located on Highway No 2 on the same spot where one French commander was executed in the Sino-French War. This headstone was a silent witness to this battle. Unfortunately, after the highway construction, the stone was never restored." 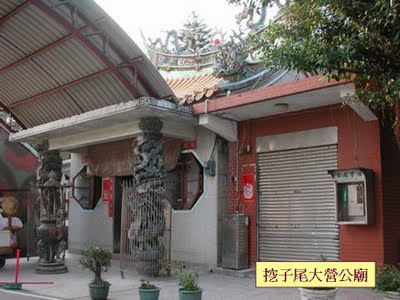 (1) The ancient graves of 湖南勇: This grave site is located at the junction of Chung Cheng East Road and Gang-zen No 2 Street竿蓁二街. There were 6 soldiers, 5 of them from 湖南善化縣: 李有章, 袁致和, 張月升, 胡芳之, and 嚴洪勝, and the 6th 李佑銓 [left] was from 永定縣. They followed General Sun from Hunan to fight the Aborigines elsewhere in Taiwan and were buried in 1881 before the Sino-French war. (2) In 1979, in an expansion project of the Danshui Golf Course, an old cemetery [the Second Public Cemetery] was cleared to make room. This cemetery contained a mass grave and 200 ancient tombs (dating back 300-400 years). Among them, 31 were identified to be 湖南勇 from 長沙府寗鄉縣 and 29 might have died in the Battle of Fisherman's Wharf [their gravestones were dated 光緒十 or 十一年 (1884 or 1885)]. (3) Across the Danshui River in Bali, in the northern shore village of 頂罟村, there is a 大營公廟 built in 1943 next to the burial ground of an unknown number of 湖南勇 who died from illnesses in ca 1884. It was renovated in 1979 [below] and adjacent to the temple now is an Army Camp. They were probably those who chose to settle in Danshui after the Battle, instead of going back to Hunan, and died later from other causes. 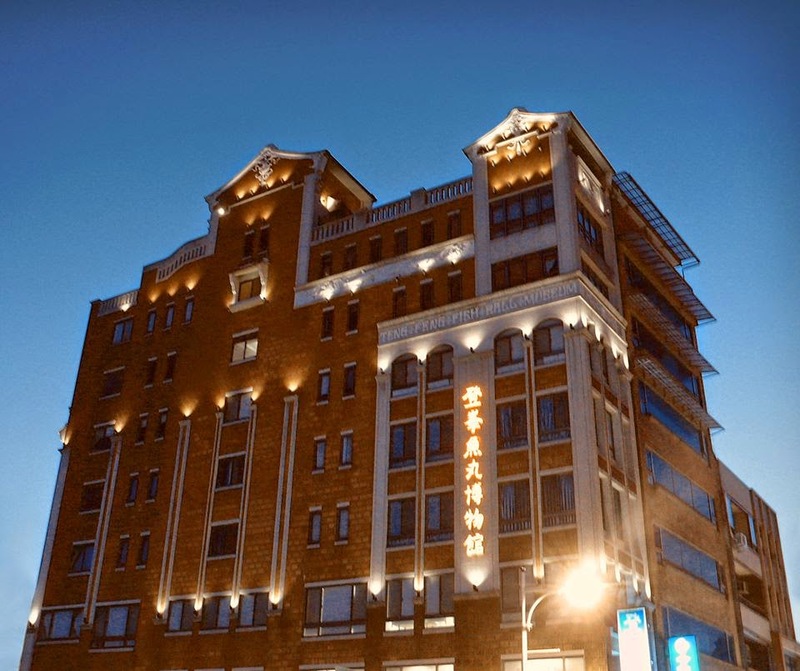 Preservation of the past is not yet a priority in the rapidly expanding Danshui. This will soon change. The establishment of a Peace Memorial in Tamsui Peace Park will now lead the way.